Dianne Borsenik is active in the northeast Ohio poetry scene, and is founder/editor of NightBallet Press. She also co-founded the legendary Lix and Kix Poetry Extravaganza and Snoetry: A Winter Wordfest. Her poems have appeared in Slipstream, Rosebud, Nerve Cowboy, The Magnetic Poetry Book of Poetry, and Haiku World: An International Poetry Almanac, among others. Her most recent chapbooks are Braless (Blasted Press) and Blue Graffiti (Crisis Chronicles Press). She also has chapbooks forthcoming from Recycled Karma Press and Kattywompus Press. You can find Dianne on Facebook, at www.nightballet.com, or at www.dianneborsenik.com. “Blue Moon” originally appeared in Dianne Borsenik’s 2009 Crisis Chronicles Press chapbook HardDrive/SoftWear. To order a signed copy, please send $9.99 to Crisis Chronicles Press, 3344 W. 105th Street #4, Cleveland, Ohio 44111.
on the blotter of the entire universe? 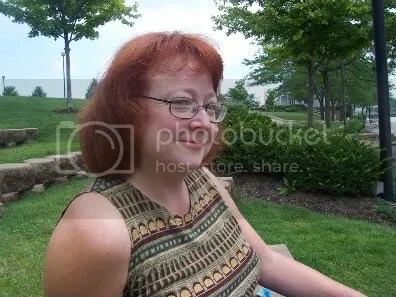 Dianne Borsenik, a former flower child and current redhead, lives with husband James near Elyria, Ohio’s beautiful Cascade Park. She has had poems and haiku published in a number of journals and anthologies, including Rosebud, Slipstream, Haiku World: An International Poetry Almanac and The Magnetic Poetry Book of Poetry. Her two chapbooks, HardDrive/SoftWear and Blue Graffiti are available from Crisis Chronicles Press. With poetry partner John Burroughs, she has co-produced/co-hosted the Lix & Kix Poetry Extravaganza and Snoetry: A Winter Wordfest series. Find her at http://www.pw.org/content/dianne_borsenik_0. Dianne Borsenik, former flowerchild and current redhead, is active in the Cleveland poetry scene. Her poems have appeared in Slipstream, Rosebud, Ship of Fools, Nerve Cowboy, The Magnetic Poetry Book of Poetry, Haiku World: An International Poetry Almanac, Eviscerator Heaven, Deep Cleveland Junkmail Oracle, Voices of Cleveland, and Naturally magazine; her chapbook HardDrive/SoftWear was published in 2009 (Crisis Chronicles Press). Both the 2008 and 2009 Cleveland RTA poetry projects included her poems, and actor Jonathan Frid (“Barnabas” on Dark Shadows) used 3 of her poems on tour in “Genesis of Evil.” She has performed her poetry in venues throughout Ohio, Michigan, and Pennsylvania. John Burroughs is a poet, playwright and musician in Elyria, Ohio, as well as the founder and editor of the Crisis Chronicles Online Library and co-founder (with Dianne Borsenik) of both the Lix & Kix Poetry Extravaganza and Snoetry: A Winter Wordfest. Discover more than you’ll probably ever want to know about John at http://crisischronicles.com. Stalk Lix and Kix on MySpace: http://www.myspace.com/lixandkix. JJ Haaz is a guitarist, composer, web/graphic designer, journalist and music instructor based in Cleveland, Ohio. His CDs include Live & Crazy, Studio Cutz (with Jackie Warren) and Dead & Back!!! (with the JJ Haaz band). For more information, please check out his website: http://jjhaaz.com.